British Silverware's team of skilled craftsmen and women relish the possibility of working on a commission or model piece. The challenge of taking a design concept from the drawing board through the manufacturing process to the finished product is always exciting. There may be problems to be solved through the various stages of the manufacturing process before arriving at the finished product of the commission or model piece. These challenges are always discussed and resolved by our team to ensure our clients complete satisfaction and as importantly that our own exacting standards are met. 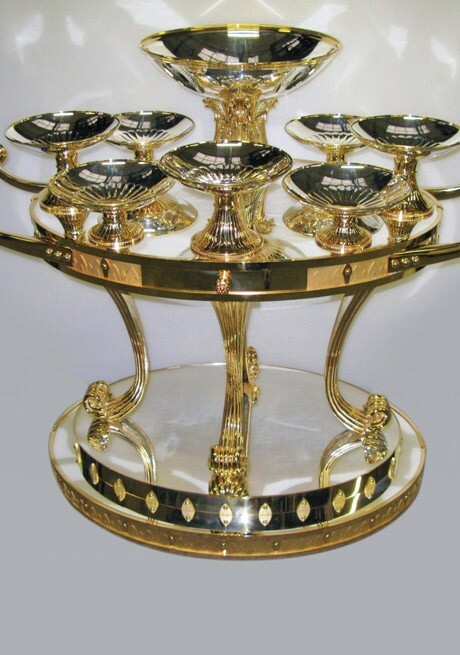 This magnificent caviar table was a bespoke commission made from sterling silver with gilded detail and crystal glass inserts. It measures 1 metre in diameter and weighs 40 kilos. Each department in our workshop was involved in producing this beautiful object. Our in-house team were involved in modelling, casting and hand chasing the detail of the fishes for the central column. There are 24 individual pieces that were cast to make the outside band of the table. 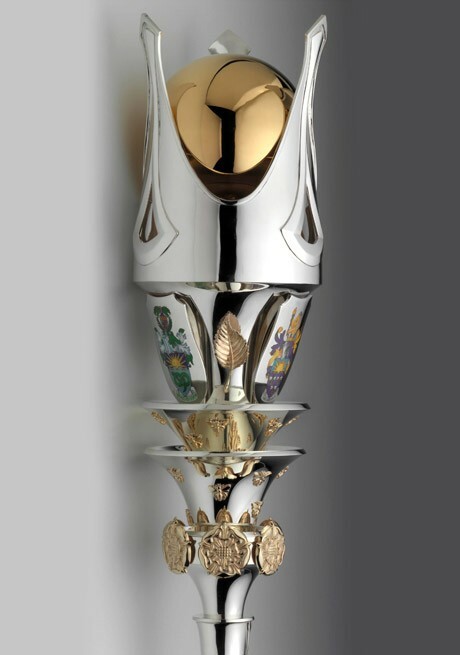 Although this commission takes its name from a centre piece it is actually three foot tall (920mm), made in Sterling Silver and fully gilt. It is one of a pair and a one-off bespoke commission for a private residence. 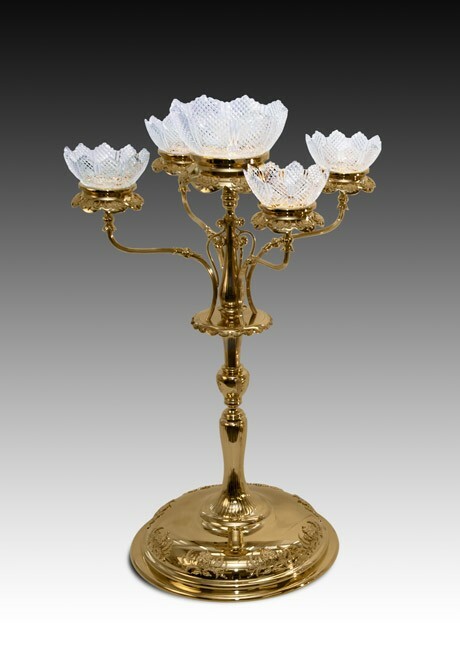 The hand cut crystal bowls which were commissioned specifically for this piece were also made in England. The fluting is hand chased and the decoration is all hand applied. The trigger for this commission was the forming of The University of Manchester following the merger of the University of Science and Technology and the Victoria University of Manchester. The Mace was commissioned for the official launch of the new university. This is a fine example of the combination of sterling silver with applied gold carvings and decoration in multi-coloured enamellings. 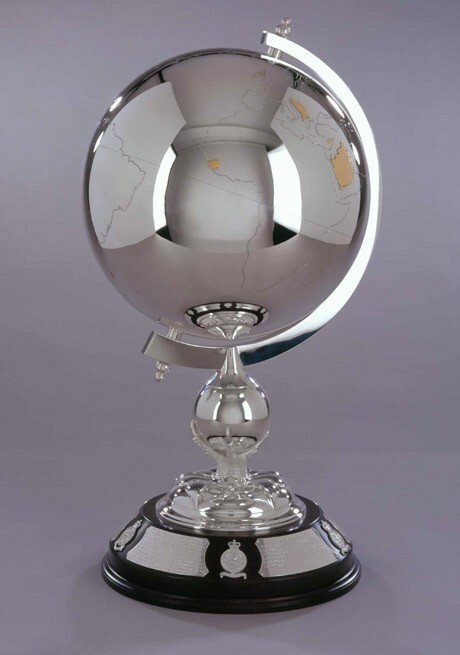 Our in-house craftsman combined their talents to create this handmade sterling silver model globe. Continents have been accurately hand engraved and gold sheet applied to highlight several countries that have significance and meaning to the client. 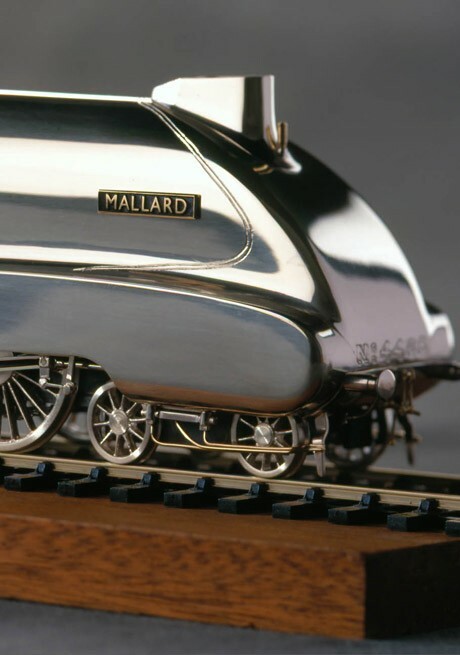 The National Railway Museum in York commissioned a special model of the Mallard steam engine to commemorate its Silver Jubilee. Using nothing other than an original photograph of the original steam engine, British Silverware craftsman designed an exact replica. This involved many weeks of design and craftsmanship to produce this bespoke 'on-off' piece. The finished product was 'shielded' using a special protective process to prevent tarnishing and to reduce general maintenance. 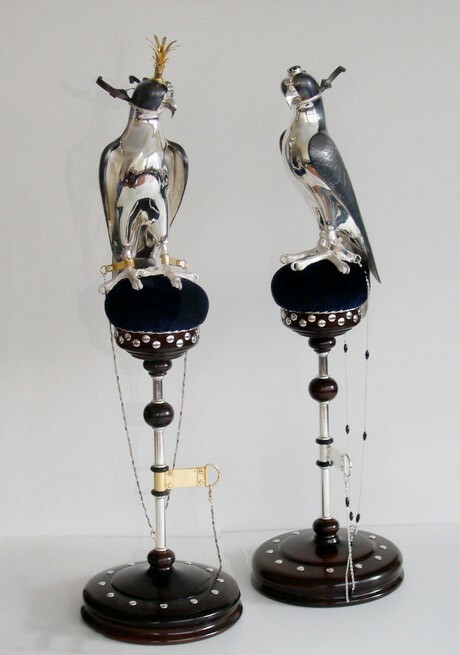 A pair of Falcons on Stands is made in Sterling Silver and has oxidised plumage on part of the breast. The detail on the hood is slightly different but both include emeralds as part of the decoration. 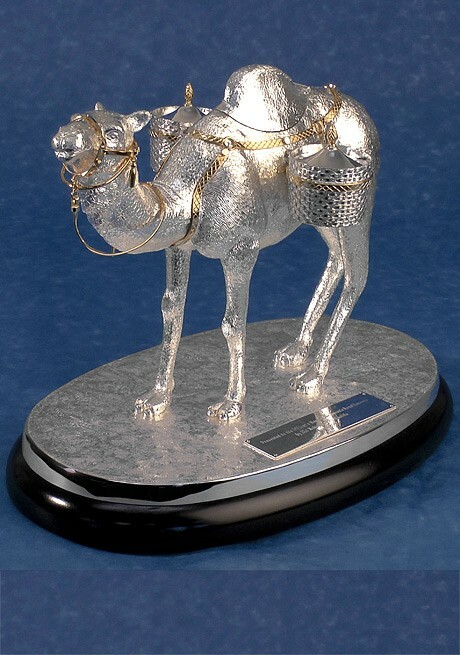 This wonderful hand chased silver and gold camel is in fact a very practical piece. The panniers have removable lids for salt and pepper and the hump has an internal hinge to reveal a mustard pot. 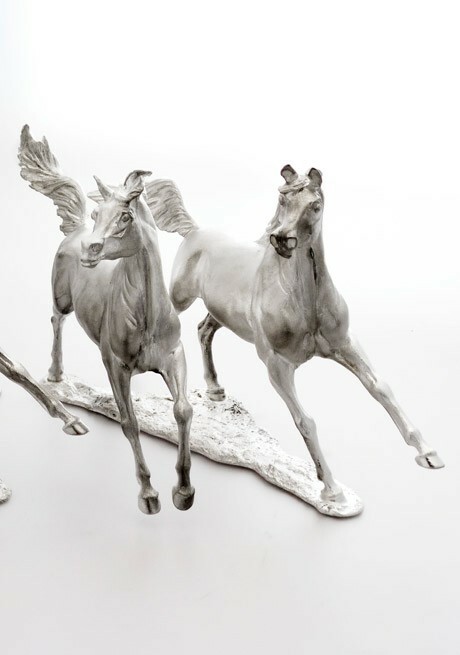 This stunning sterling silver sculpture was commissioned by a private client to complement a table centre piece. 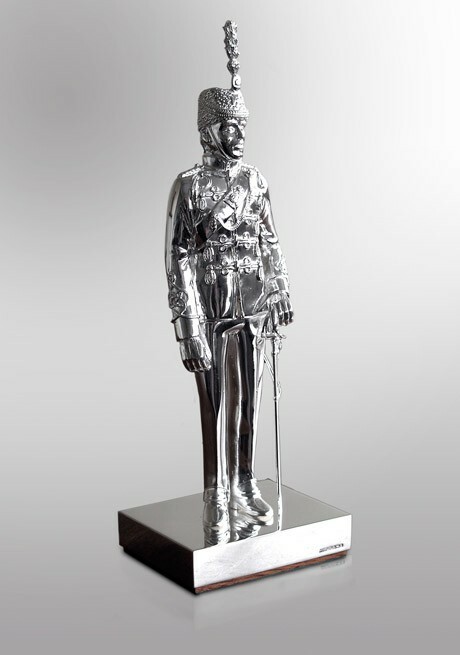 An exclusive sculpture created for the Royal Dragoon Guards. It is purchased as a wedding gift by fellow officers. This was a very personal commission to make a model of a soldier for a client using nothing other than an original photograph. The team in our workshop used other points of reference to ensure the detail of the model was correct. Each part of this piece was individually modelled and cast to build up the figure. Our client wanted a very personal gift for members of their household. We received a picture of the iron work at the client's residence and used this as decoration round the top of the box. This design is the client's personal favourite. 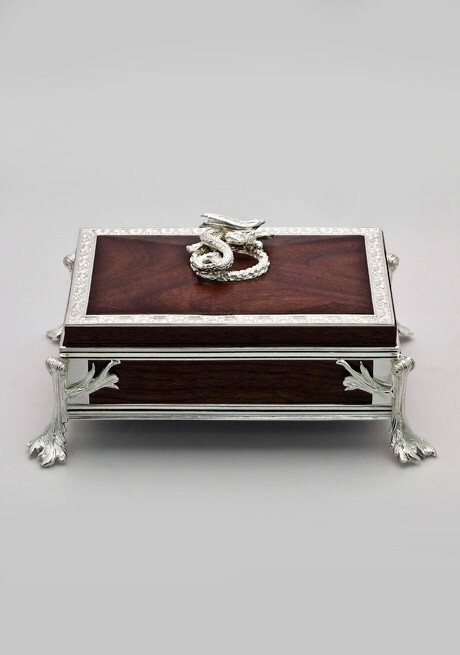 The dragon and other features were also made to the client's specification and the whole interior was hand-lined in velvet in our cabinet department. 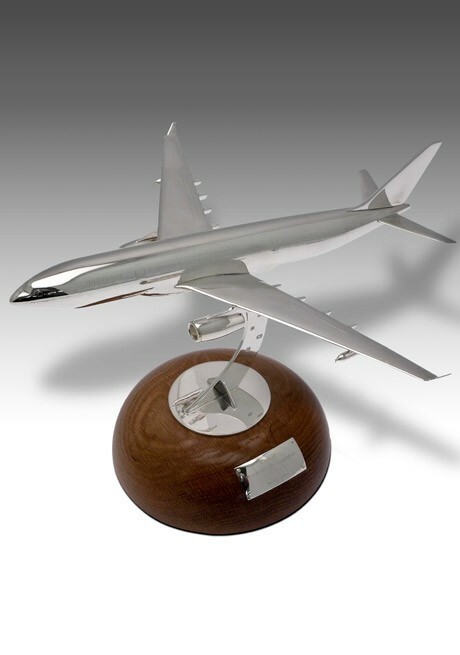 This model was commissioned by Air Tanker to commemorate the delivery of Airbus A330-200. The client required a model of exact scale to the actual Airbus and this model was created in 1:200 scale. 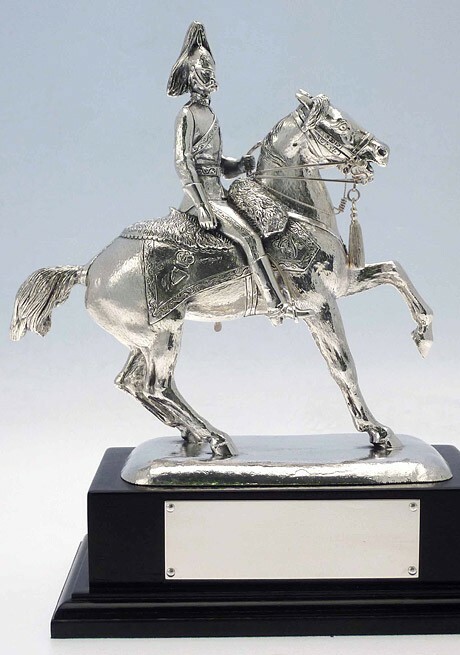 This 'one-off' bespoke model is a typical example of British Silverware work.